As I said last time, the next step was to make and install the wood fillers for the "B" pillars. Here they are, painted and ready to install. These are cut and shaped from poplar and painted black. 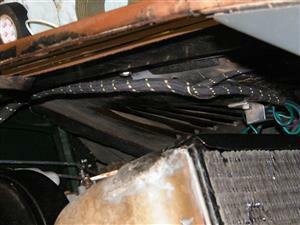 They are retained by stainless steel sheet metal screws. The originals were a combination of plywood, something that looked like oak and some other wood similar to poplar. And here they are installed. I found a great source of screws and other fittings for older cars at Restoration Supply Company. Their online catalog has an amazing amount of stuff for restorers. I found everything I could imagine in the period correct slot head screws and trim washers. It has become impossible to find slot head screws at the local hardware stores, especially in stainless. I know chrome plated would probably have been used originally but the stainless looks very similar and, unlike chrome, will stay that way forever. 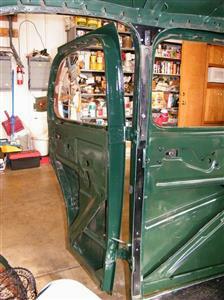 With the inserts installed, I could then make and install the draft excluders for the front doors. Since there was no requirement at this time for the rears, I elected to leave them until they are needed. I retrieved the interior materials from the attic and found the roll of vinyl purchased some years ago. To my dismay, the vinyl roll had no ridged core and had folded in a couple of places. The hard set wrinkles were not to come out. I had to purchase another 4 yards. Fortunately, I was able to get an excellent match. 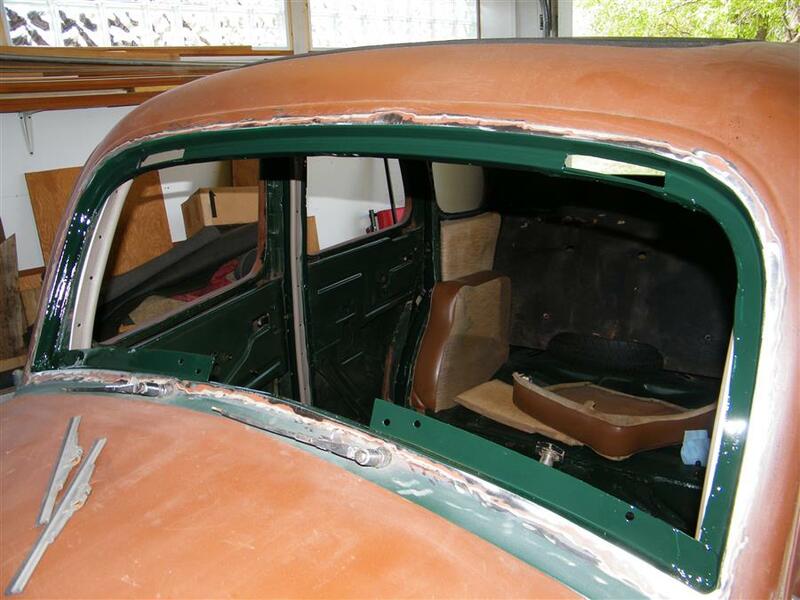 The old wrinkled stuff will be used in less visible areas, such as the back seat outer in the boot and others. There is still enough good to make the draft excluders. 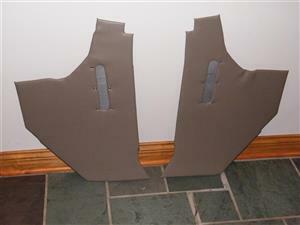 After the draft excluders, remember those are the door windlace, the next item was the kick panels. I cut new panels from what the industry calls "waterproof fiber board" which is a highly compressed fiber board with a fairly slick finish front and back. I used the old masonite panels that I made many years ago as patterns. The only reason to replace the masonite was that it is a bit too thick, making installation of the shelf more difficult. I laid a layer of thin cotton on the faces of the panels then covered them in the vinyl, wrapped around the edges and glued to the back side. 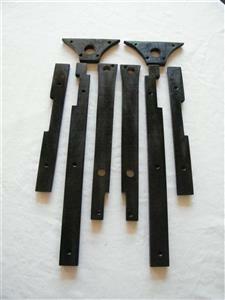 These are then attached to the door jamb with the nice screws mentioned above. The color of the installed one is correct. It looks like I needed more light or flash for those against the wall. Here I have to digress a bit. I had removed the door glass some time ago. I think an earlier chapter talked a bit about working on and painting the regulators. There will be more on that in a future edition. Anyway, at this point, I really wanted to paint the recess behind the windscreen when it is closed before reinstalling the fascia. It also seemed prudent to get all the glass replaced while suitable materials, channels and scrapers and such, are still available. None of this stuff has been used on modern cars for many years. So, I removed the remaining glass, took it to City Glass after making backup paper patterns. They recommended tempered glass for the doors and laminated for all the others. Only $800 later, I have all new glass and all the other materials ready for installation. Now just to store it safely until ready to install. Anyway with the glass out, I was able to paint the windscreen surround and the recesses around the back glass and the two quarter windows. 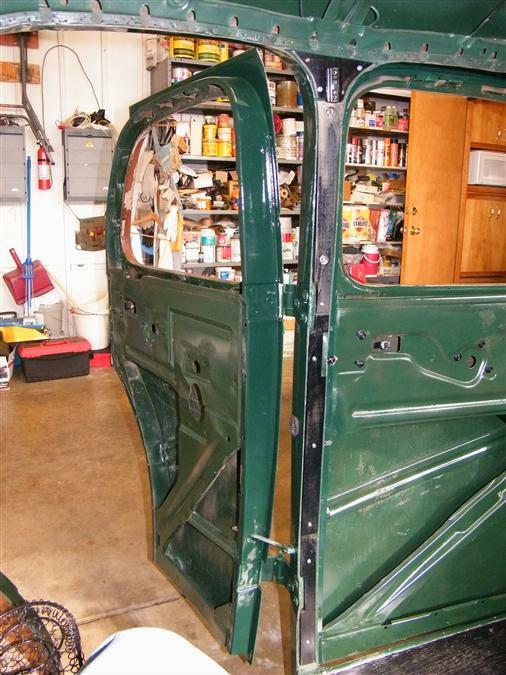 That with the door jambs should take care of everything that has to be body color but that would be difficult to get to later when the body is painted. 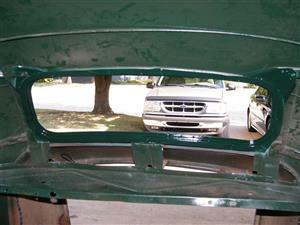 For these, I got LM Auto Color to mix a quart of single stage matching paint. I had used all my remaining Deltron. The back window is shown from inside the car. The flange across the bottom of the front is where the fascia mounts. 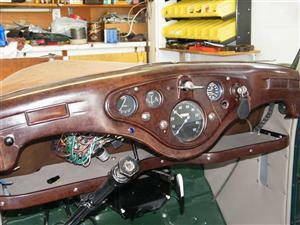 The gap in its center is for the windscreen opening mechanism. The open slots at the top are for its hinges. Now back to the main thread. I covered the shelf in the same vinyl as the kick panels. 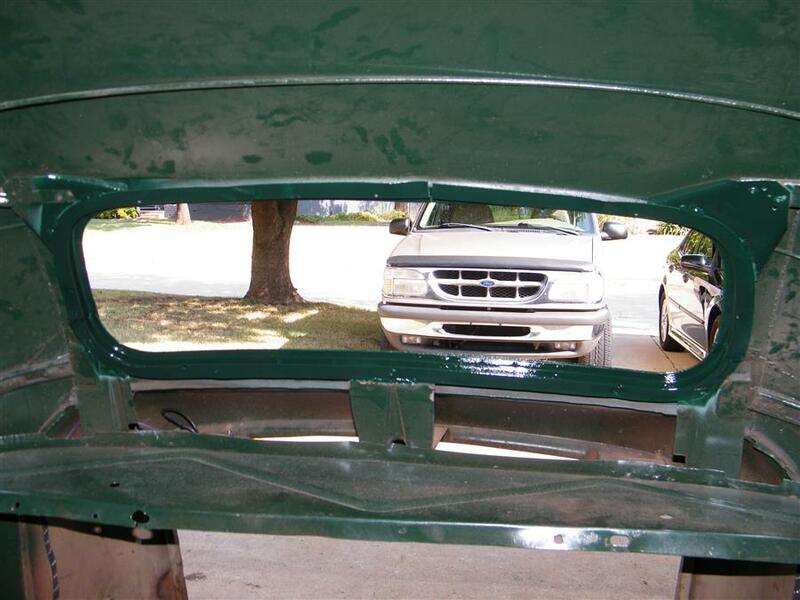 The frame is mounted to brackets through the kick panels and by brackets to the bulkhead. The shelf is attached to the frame by screws that do not show in this photo. I then made a small welting from some brown vinyl to fit between the fascia and its mounts, glued it to the fascia then mounted the whole thing. You can just see the welting above the fascia. I am still trying to determine how to hide the fuse box and its related wires and relays. Finally, I could finish up the wiring. 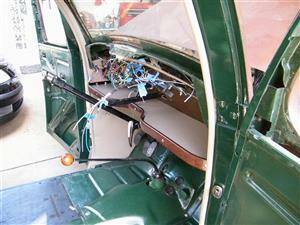 The left photo is a closeup of the offside main harness as it connects to the control box and horns. Just above the horn is a sample of the clips that anchor the harness. The car had a handful of these clips when I got it although the harness was gone. I know I have made more than a dozen additional ones in various sizes to accomodate the entire harness. 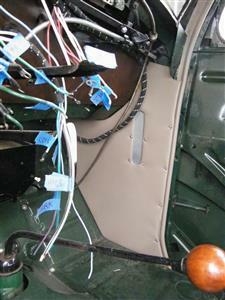 The other photo is of the nearside main harness where it splits. The small branch goes to the headlight and sidelight. The larger one goes to a five-way connector hiding in that silver bracket. This feeds the manette tube for the turn indicators and horn button as well as the brake light switch. 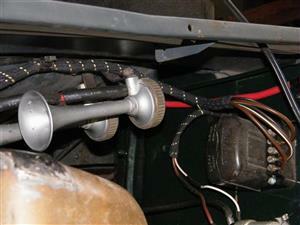 A separate wire also exits here for the fog lamp. These two harness sections are almost independent of one another, there being only a couple of wires in common. These are joined by bullet connectors. 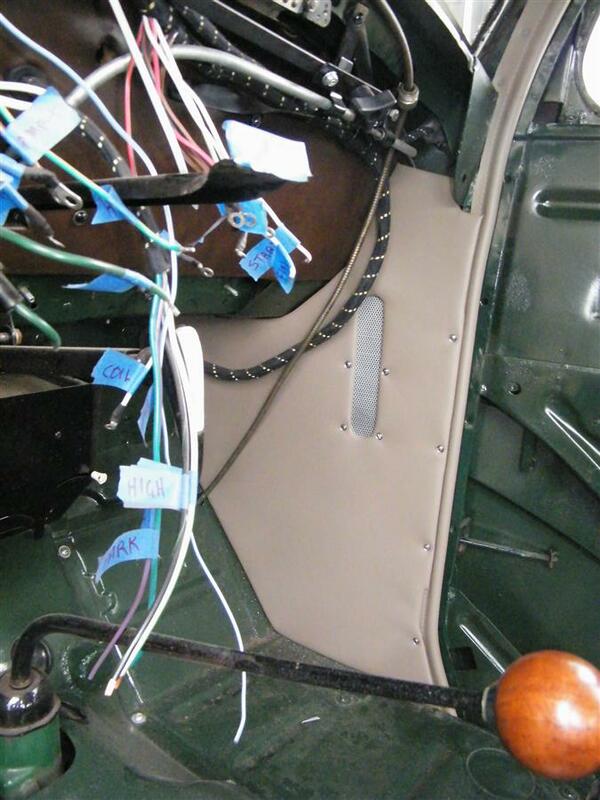 The remaining wires all terminate behind the instruments or at the fuse box. Keeping them separate may be a big advantage if there is ever the need to service or remove part in the future. 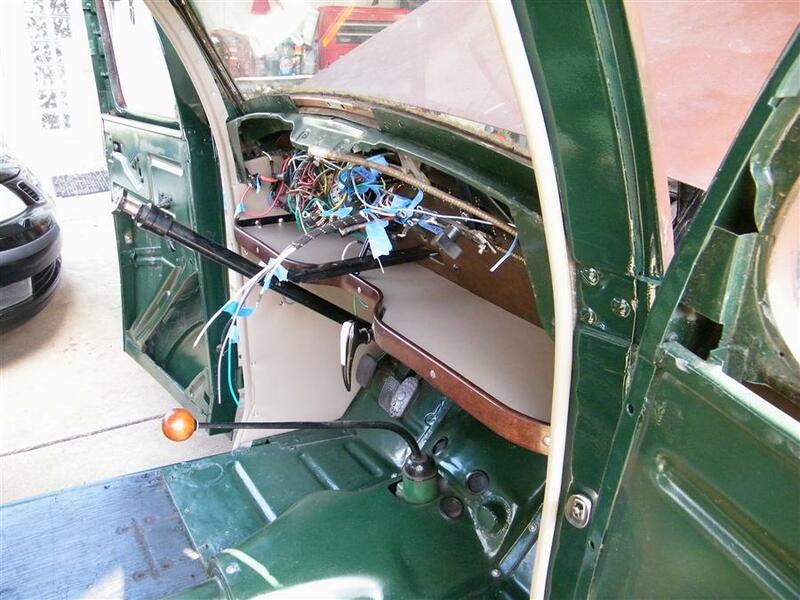 As pointed out in an earlier chapter, the original route for wiring to the cabin and rear of the car was inadequate for my enhanced scheme. I finally devised a logical means of separating the functions such that I could run cables of five wires each through the channels provided on either "A" post which did allow just enough room to make it work. 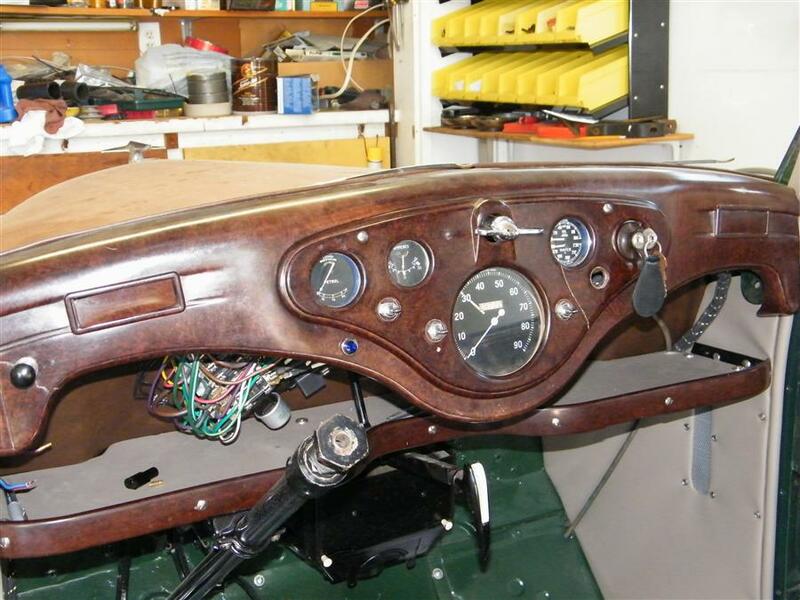 So, like the front harness, the rear is also split into a left and right side. The left operates the left turn light and trafficator, the fuel gauge and auxiliary fuel pump and the left door switches. The right operates the right turn light and trafficator, the cabin light, the right door switches and the right tail light. At the rear, there is a single jumper from the right tail light to operate the left tail light and the tag light. Once the harnesses clears the "A" post, there is a convenient channel above the doors and the quarter windows that carry them to the rear. It almost seems a shame to hide all that really nice braided harness but that's how it is, I guess. In the boot, where they may be exposed, there is a welding flange where the boot extension was attached, that serves as a useful point to hang them with some more of those original style clips. Well, that's about enough for now. Next we'll discuss installing the auxiliary electric fuel pump and reviving the hydraulics. Those are already done but it is too long a story for this chapter. Thanks for reading and check back soon.